In learning about the atomic bombings of Hiroshima and Nagasaki, we get some idea about the effects – immediate and long-term – of a nuclear blast. But many of today’s nuclear weapons are much more powerful than the early A-bombs. 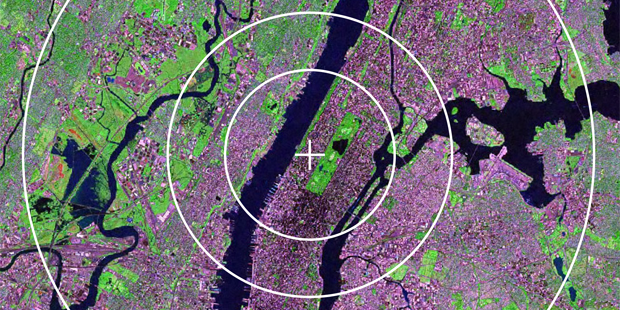 What would happen if a large hydrogen bomb were dropped in the middle of your city? Who would live and who would die? Encourage members of the public to consider these frightening questions in the hope that it will strengthen their opposition to these worst weapons of terror. Produce a target map using a statellite image of your city. Draw in any landmarks on the target to give a better indication of the strength of the blast. With a group of friends, create a giant red “X” in a public space to mark the hypocentre. Explain to people what would happen if a nuclear bomb were dropped right there. Hand them a copy of your target map and ask whether they think they would survive.